Readers of the English language might take one look at words such as Cwmystradllyn, Tre’r Ceiri, Moelwynion, Gwastadnant, and Llanfairpwllgwyngyll and turn around, hands in the air, surrendering to confusion before even taking another look. They would be missing out. Those alien, unpronounceable words are actually the names of the near and dear locations where Kyffin Williams (1918 –2006) lived, which he in turn bequeathed to his landscape paintings. Earthy. Sensuous. Moody. Mesmerizing. 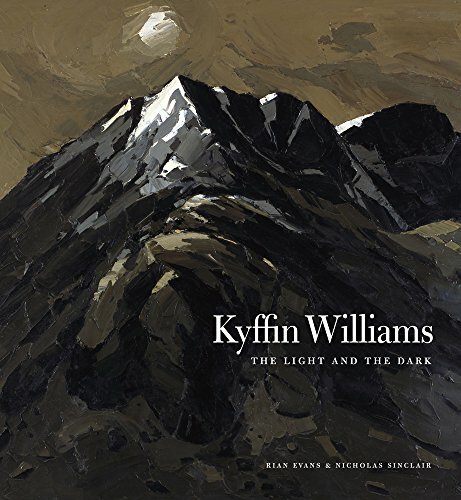 Those are the perhaps more familiar words Rian Evans uses to describe said paintings in her monograph tribute, Kyffin Williams: The Light and The Dark. Far from being incomprehensible, Evans’ narrative pulls readers in and endears them to the artist who came to be the pride and joy of Wales and Great Britain. A Welshman through and through, Kyffin’s paintings seem to tap into the very heart and soul of the land and its people. They are filled with the unrelenting power and presence of the sea and the sky. They manifest the reality of a harsh existence tinted with a wash of melancholy. At his core, “He had,” says Evans, “an ability to sense something of the quiddity of place and man’s fragile placing within it . . .” In other words, Kyffin could paint the essence of Wales, a quite elusive thing to capture. Suffering the fate of many an artist (Delacroix, Degas, Gauguin, Goya, Rothko, Kahlo, etc. ), Kyffin was plagued by health problems both physical and psychological. He related specifically to Vincent van Gogh, finding solidarity with this artist’s struggles as well as his artistry. Yet Kyffin’s rugged, congenial personality and “life force” allowed him to persevere. He lived a productive, successful, creative life well into his 80s. Still, Kyffin felt both part of this landscape and peripheral to it. His illness kept him distant, isolated and mysterious, closing doors to his preferred career choices, preventing him from becoming a family man. Tracing the ins and outs of various circumstances, Evans leads the reader through a Kyffin chronology of stoic independence. She touches briefly on his childhood, art school, teaching, travel, and his stylistic and thematic pursuits. Her background as a writer is evident in the way in which she balances biographical information with discussions of various artworks. Life experiences blend seamlessly with painting techniques. As the reader works their way through the book they will wonder, Why have I never heard of Kyffin before? Indeed, considering factors such as his bold, incomparable, identifiable style; his prolific production of over 50 years and 6,000 paintings; his reverence and renown in the Welsh gallery circuit; his prominence in the Royal Academy; and his knighthood bestowed in 1999, it is remarkable that he has been virtually overlooked outside of the United Kingdom. Actually, Evans ventures an explanation, “Since he lived such a long life, the occasion of his centenary may not offer quite enough distance to assess his achievement; maybe a little more time is needed.” Time is exactly what is extended here with the opportunity to savor and contemplate over 150 stunning and intense examples (Sinclair’s contribution to the project) of Kyffin’s oil painting, water colors, linocuts, and pencil sketches. No doubt, once this body of work has had the chance to be absorbed, history will conclude that Kyffin’s work goes beyond formulating a Welsh national identity and speaks directly to the source of human nature itself. It lends us a pure and intuitive emotional language capable of crossing hardened geographical boundaries. In no time at all, Kyffin Williams: The Light and The Dark will make Cwmystradllyn, Tre’r Ceiri, Moelwynion, Gwastadnant, and Llanfairpwllgwyngyll feel as familiar as if they were in our own back yards.